Former Bears linebacker Pernell McPhee has begun his first visit of free agency, meeting with the Redskins on Sunday night, NFL.com’s Ian Rapoport tweets. The meeting will continue to Monday. 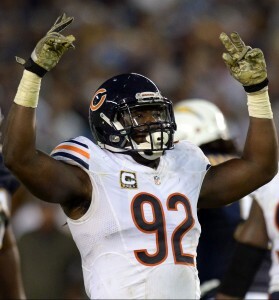 Highly sought after as a free agent in 2015, McPhee, 29, struggled with injuries as a member of the Bears. The Bears signed him to a five-year, $38.75MM contract and he made $23.2MM. He was set to earn $7.5MM this season and his release cleared $7.1MM in cap space for Chicago. He contributed 14 sacks and 90 tackles while making 17 starts. If he signed with the Redskins, Washington would assuredly hope for a return to his Baltimore days, when he logged 17 sacks in four years as a rotational pass rusher. The Redskins have been busy on the defensive side of the ball early in free agency, re-signing linebacker Zach Brown and setting up meetings with cornerback Orlando Scandrick, defensive end Benson Mayowa and defensive tackle Johnathan Hankins.